In 2004, Jesse Sunnenblick interviewed Jerelle Kraus for The Columbia Journalism Review. When I read the article, I thought to myself: There's a book here! In fact, I thought: There's one heck of a GREAT book here!... Little did I know, the book was already well underway. Four years later, the lucky folks who attended ICON 08 got a small taste of that book, dished out from Jerelle herself. Now you can bite into the whole thing. Stepping boldly out on a limb here: This may well be the most important book ever written on the subject of editorial illustration to date. It's a chronicle of where ediorial illustration has been, how it got to where it is today and shines a bright light on where it should go from here. But don't just trust me, the esteemed (is he a Knight yet?) Ronald Searle said it's "Certain to become the illustrator’s bible". Everybody's in it - recognize any of these names? In or around NYC? 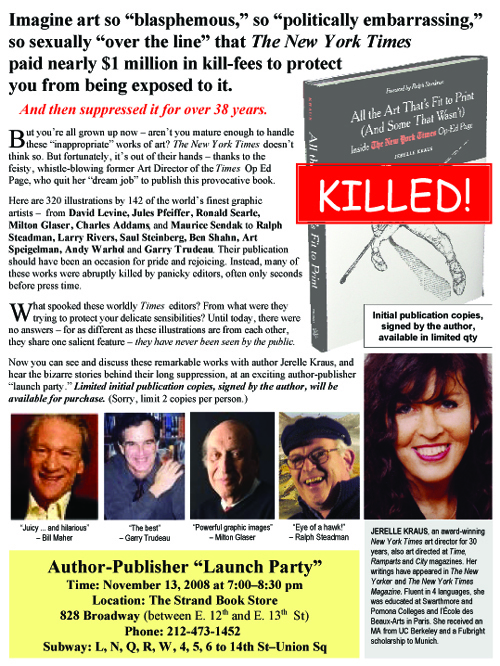 Attend the book party at the Strand, November 13th. She'll sign a book for you! Buy one for a friend. Buy one for your least-favorite art director. Buy two for you favorite art director, for sure! Oh and - Jerelle has agreed to do an interview with me over at illoz, so look for that coming soonish. Should be fun! Fantastic. TWO great events on Nov 13th in NYC, AI and now this. Thanks for the heads up, Zimm. The rise and fall of this page is huge issue for us. Because the page sets the standard for the editorial world. The NY Times has for a long time now behaved like this never happened. Like the page started sometime in 1999. What Jerrelle has done is to put this on the table in a major way. Like a one-woman truth and reconciliation commission. Let the soul-searching and truth-telling begin. And let's get some important art done in important places once again. PS: NY Times, if you lost 50% last year as you are, why not now try some steel in the spine? Can't believe it... I'm missing the book party this week and the signing the week after because of teaching. Think I feel a cold coming on...! This book is not only an important one, it sounds extremely entertaining, too. Publishers Weekly put it this way, "In this overflowing treasure chest of ideas, politics and cultural critiques, Kraus proves that 'art is dangerous' and sometimes necessarily so." I can't wait to get my copy. There's a party for the book launch this Thursday at the Pen & Brush Club that Barry, Michael and I are playing at. Not sure if it's by invite only. Apparently not all the art. I did some of my favorite political work for Michael Valente on the OP-Ed. I didn't make the cut. Huh? Otherwise, it seems like a good buy.